Nail Polish Wars: The name says it all. It'll break your jaw. The name says it all. It'll break your jaw. Hi everyone! I had epic amounts of fun with this mani! If someone ever mentions jawbreakers, and you're mind immediately goes to the image below, then you're fab in my eyes. I mean, come on, was that not the best movie?! LOVE IT! I started off with three coats of Pretty & Polished Jawbreaker, of course! It's a fantastic white creme, that is loaded with multicolored micro glitters, and multicolor hex, square, and bar glitters. Quick translation: It's awesomeness in a bottle. The formula is flawless! Two coats would have honestly done the trick. I decided to go with three to add further depth to the glitters. Pay attention to what I just said. Two coats would have done it. Two coats of a white creme. How often does that ever happen?! I always have to use three coats of any white polish. I added one coat of SV for extra shine. I could have stopped here and still have had a great jawbreaker looking mani, but I wanted to add some of the splatters that you always see on jawbreakers! I used the straw technique to splatter on Sinful Colors Luminary & Sinful Colors Athens. To achieve a more subtle splatter, I simply held the straw much further away from my nail. Sinful Colors Athens, a deep dusty teal, worked out really well for this. 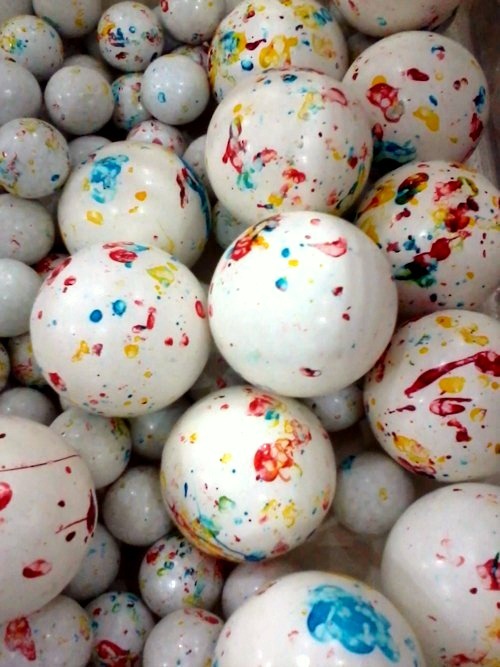 The majority of the splatters turned out very thin and wispy, so it didn't over power the beauty of Jawbreaker. Sinful Colors Luminary, a soft shimmery coral with light orange untones, was a nice addition as well. The shimmer it has really made it pop! I followed the splatters with one coat of SV. This may not be one of my more complex manis, but I love it! I think of a different Jawbreaker movie quote every time I look at my nails!!! I hope you enjoy! How do I get this color!!!!??? This turned out sooo fun!!!! I am sorry that I have been such a silent follower as of late... But I have been enjoying your posts. No worries sweetie! I've been uber quiet lately too!!!! so fab. the best part of jawbreaker is marilyn manson. i think i need to go watch this now! I love the result! It looks so different and unique! These are so stunning (and yes I thought of the movie, now I have to go see if it's on Netflix cause I got a nostalgia hit). I always love swatches of Jawbreaker but it looks even more awesome with tiny splashes of color you added! OH my GOSH these are the ultimate jaw breaker nails! I love that polish but you just took it to the next level! This is awesome. I love jawbreakers. I think I'm too old to know that movie. I've never heard of it. :/ I LOVE this mani though! fabulous result! I love it so much! pretty, and yes I did have to laught about the movie, watched it with my daughter !! Ooooh this is perfect ♥! Wow, sooooooo good. I might be having a fan-girl moment. Love it. What an awesome idea! This is super cute! Amazing mani! You are always so creative, it looks just like a jaw breaker!! wow you got the look down perfectly! my pretty n polished order just arrived yesterday and i finally got jawbreaker this time around :D i can't wait to try it!! Check my heart rate, Doctor! !